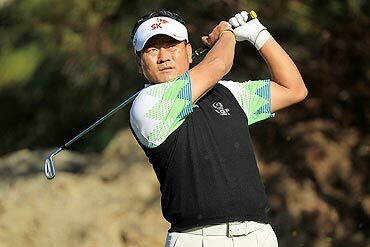 South Korean KJ Choi, who regularly practises in strong winds at his US base in Dallas, was seemingly unflappable in 35 miles per hour (56 km/h) gusts during Thursday's first round at the Chevron World Challenge. 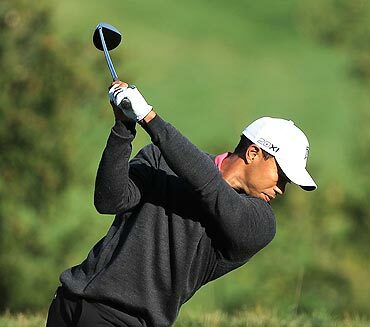 The 41-year-old is renowned for his ability to keep the ball low in windy conditions and, with his putter on song, he charged into a three-shot lead over Americans Tiger Woods and Steve Stricker after opening with a superb six-under-par 66. Choi's only surprise was that the strong winds forecast overnight failed to arrive at Sherwood Country Club until he had teed off at the par-four sixth, by which time he had recorded five consecutive birdies. "Today I wake up early, so I am looking around outside the window and it looked very calm," Choi said. "Last night, the weather (forecasts were) saying 45 mph (72 km/h) and 60 mph (97 km/h) winds. But I'm very confident in the wind, playing with my low ball, the high draw and low draw. "And I started very quick, and got my best record in the (first) five holes with birdies for the first time." Choi, who won his eighth PGA Tour victory and the biggest title of his career at the prestigious Players Championship in May, downplayed his experience in windy conditions. "Living in Dallas, where there are 20, 30 mph (32, 48 km/h) winds every other day. 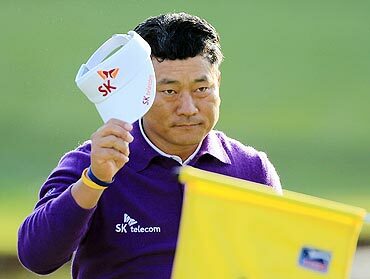 I'm used to practising in those conditions," the 41-year-old Korean said through an interpreter. "And throughout the years from just playing in the wind at tournaments, I've become very comfortable with those windy conditions. "But I don't think practising in windy conditions really gave me the advantage today. Overall my game has really improved. This being the second time for me to play here, I felt more comfortable. And putting really helped today." Playing three groups behind tournament host Woods on Thursday, Choi was impressed by what he saw from the former World No. 1 on a couple of holes on the front nine. "He is really 80, 90 percent back to his form again," Choi said of the 14-times major champion who has not won a tournament in more than two years while struggling with his game and fitness. "I'm very happy about playing with him tomorrow. Tiger is a good friend and he's got a very strong will. He's got the right mental attitude right now, and I think it's going to be a very fun day tomorrow." Choi, the son of a rice farmer, watched Woods hit shots on the fifth and sixth holes and was suitably impressed.